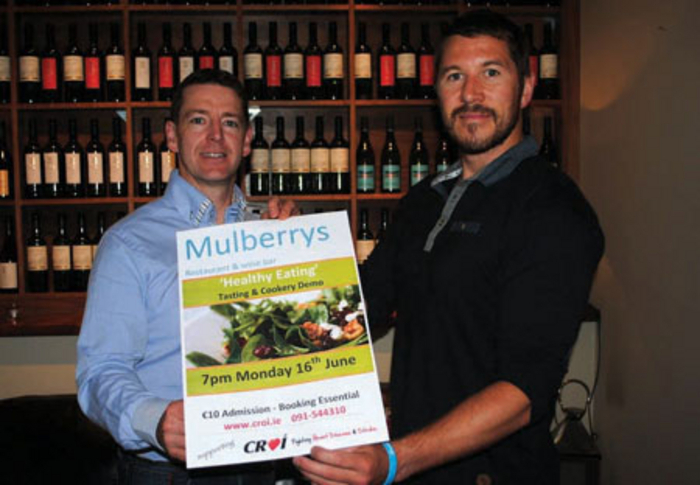 James Cunningham of Mulberry’s pictured with Barry McCann from Croí announcing details of Mulberry’s healthier lifestyle cookery demonstration. The healthy cooking demonstration will take place at Mulberry’s Restaurant at 7pm. Tickets cost €10 each and are available by telephoning Croí at (091 ) 544310 or by logging on to www.croi.ie People will receive tips and advice on the night about how to use ingredients for maximum heart health benefit. Croí dietitian Claire Kerins will be on hand to answer dietary and nutritional questions. Mulberry’s has worked in partnership with Croí to develop a wide range of delicious healthy meals which were added to their extensive menu.